Having an outdoor ceiling fan on your front deck or patio is such an excellent way to keep yourself refreshed, especially on hot summer days. It’s also cheaper and more cost-efficient to use an outdoor ceiling fan to keep you cool, instead of using an air conditioner. When looking for an outdoor ceiling fan, there are a few factors to take into consideration. Here are some of the basic things that you need to ask yourself when choosing a ceiling fan for outside your home. Are you installing the ceiling fan in a “damp” area or a “wet” area? The Underwriters Laboratories or UL definition of “damp” is when the fan is under a roof or a porch and does not have direct exposure to water, such as rain or snow. Fans that have a UL rating of “wet” are sealed and can endure direct exposure to water. When installing a wet ceiling fan, however, you need to make sure that you use the required hardware to protect the ceiling fan’s internals and electrical connections from water. What type of mount should you use? Determine the ceiling height and also ascertain if you will be needing to use a close mount or a down rod. Also ask see if you will need a “hugger” mount. What is the minimum fan clearance? – At least 12 inches from the ceiling. – At least 24 inches from the blade tip to the nearest wall. – At least 84 inches above the floor. What size of ceiling fan should you buy? – A 36-inch ceiling fan will cool a room with an area of 144 square feet. – A 42-inch ceiling fan will cool a room with an area of 225 square feet. – A 52-inch ceiling fan will cool a room with an area of 325 square feet. What is the best style for your space? 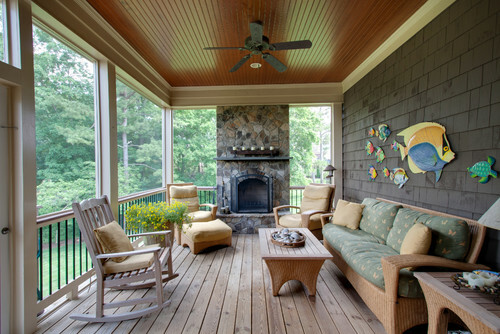 Your outdoor ceiling fan’s design should blend with the rest of your porch’s scheme. If you have a Victorian porch, you may want to consider a traditional type of ceiling fan. 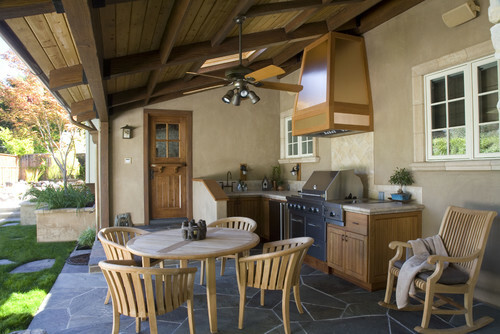 For a Tuscan outdoor dining area, a rustic type of outdoor fan will be perfect. Modern outdoor spaces will require modern style ceiling fans. The key here is to stay committed to the décor of your space so that your ceiling fan’s design does not clash with the rest of the furniture and fixtures of the area. What color and material should you choose? If you want your outdoor ceiling fan to blend with the ceiling, pick one that has a solid color which is identical to the color of your ceiling. If you intend to make a conversation piece of your ceiling fan, select a bold color or style that would stand out. Most ceiling fans are made of powder coated metal, which rusts over time if mounted outside. The best material for outdoor use would be aluminum or stainless steel. Ceiling fans made of stainless steel do require maintenance and regular cleaning so they don’t develop “tea stains” which may seem like rust. Aluminum ceiling fans on the other hand are trouble free. By taking note of these basic requirements for outdoor ceiling fans, you are sure to get one that will not only look great in your patio or deck, you will also be making a great investment for a fixture that will perform for several years to come.